"Together we can & Together we will"
While in the office, can you have lunch with positive people? Of course, don’t forget to wish everyone, but have lunch and refreshment with only select colleagues. If a set of people are discussing a negative topic, somehow find an excuse to leave the place. You need not give the impression that you are holier than the rest. Amongst siblings, if there are negative people, just negotiate with them to talk only positives in your presence. Slowly they may also change if you do not put any pressure on them. After all, they also love you. In weddings and social functions, avoid the temptation to gossip. If there are a few gossipers, gently leave the place under some pretext. Even if you come across negative characters while watching or reading books, try to swap the channel or skip the page in the book. Many times even such things can create negativity in our subconscious mind. 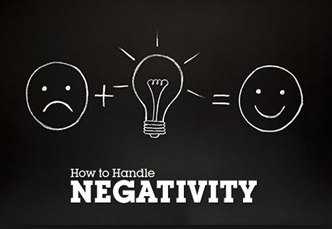 Last but not the least, see whether you have negative thoughts or negative approach. The best tool available for you is practicing self-introspection every night before going. By being aware of your negativity, you can take corrective steps. A few people ask me the question, “Can we change negative people by our association?” Most of the time, the reverse happens, that is they may spill over their negative on us. In my opinion, it is better to play it safe. Of course, if you are a Mahatma Gandhi or a Mother Theresa, you may ignore this! Why happy approach in Corporate Innovation?